Here at UKFast we are firm believers in the connection between sport and business. And we’re even happier to see a connection between business, technology and sport. So when we saw that search engine Giant, Google have recently unveiled new cutting edge technology, talking trainers, we were pretty excited! Designed to motivate the wearer the trainers are fitted with Bluetooth technology which communicates to the wearer’s headphones. With comments such as ‘Are you a statue?’ and ‘This is boring’ when the wearer is still and more motivational comments such as ‘You’ve made me a very proud shoe’ after exercise, the trainers aim to give people the encouragement they need to get out and do some exercise. The novelty of the new trainers may well be the ideal solution to get less sport-focussed people off the couch. It’s great to see another example of technology pushing the boundaries. Especially used in areas such as exercise, in which technology is often blamed for reducing the amount of time people are active for. Could these trainers finally balance out tchnology’s bad reputation for keeping people sitting on their bums? 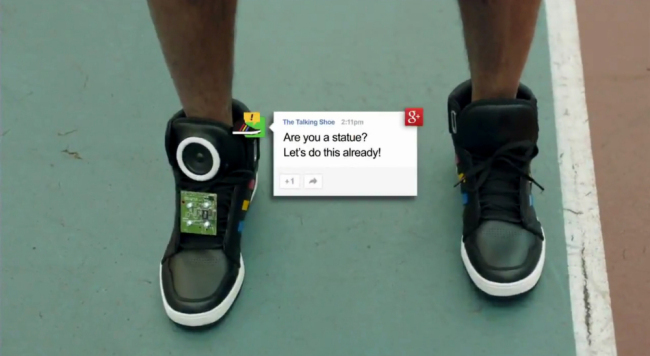 The technology is a collaboration between the digital agency YesYesNo and Google. And the clever bit? It works by connecting an Android smartphone via Bluetooth and then, using an accelerometer and a gyroscope, turns the activity into the commentary heard through the headset. Being able to enjoy exercise reaps benefits in all areas of our lives. As we all know at UKFast many of the approaches and skills that are needed in sports can be easily transferred to ensure success in business. The team here is encouraged to keep fit and healthy and we often get the teams out to Snowdon and take advantage of the fresh Welsh air! Unfortunately the trainers won’t be available to buy any time soon. Will you be looking out to get some when they eventually go on sale?